One Touch EMR is designed to be simple and instinctive, allowing you to chart faster than with other EMR systems currently on the market. What makes our system system unique is that it's literally designed and developed by a physician who understands how physicians think, and knows what is needed to provide an effective EMR solution to the obstacles currently seen in practice. Get your visit documented fast using familiar workflow that you already know. There are no annoying pop-ups, icons or other distractions. Typing is kept to a minimum letting you spend less time staring at a computer screen, and more time face-to-face with your patients. Your documented visit is automatically in compliance with CMS Evaluation & Management (E&M) coding guidelines; rejections are thereby reduced – that means less potential for an audit and more money in your pocket. 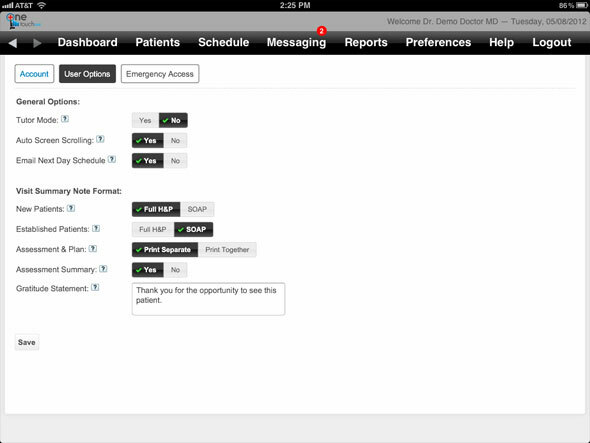 It's like having a virtual Biller/Coder to guide you through your visit! Quickly and easily triage incoming faxes and documents, and send outgoing faxes from within the EMR itself with no extra software needed. Unlike many other EMRs, our product is completely customizable to your specific practice needs... everything from colors and text to creation and design of your exam templates, even the format of your H&P notes! 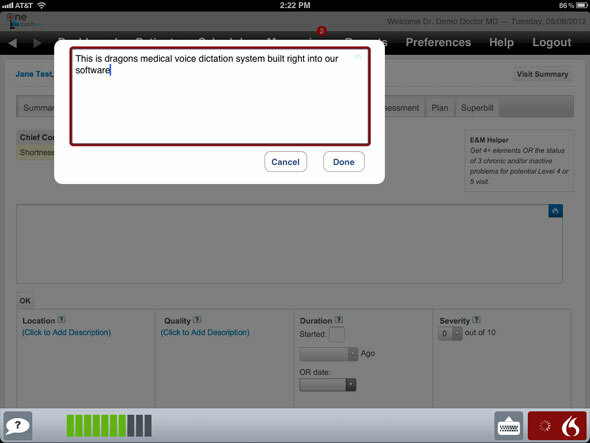 Unlike some EMRs, you (and only you) own your patient data. We never sell your patient information - de-identified or not! Rest easy knowing your patient data is secure with military-level encryption. No up-front costs or contracts. One low monthly fee includes all support, software upgrades, and peace-of-mind. 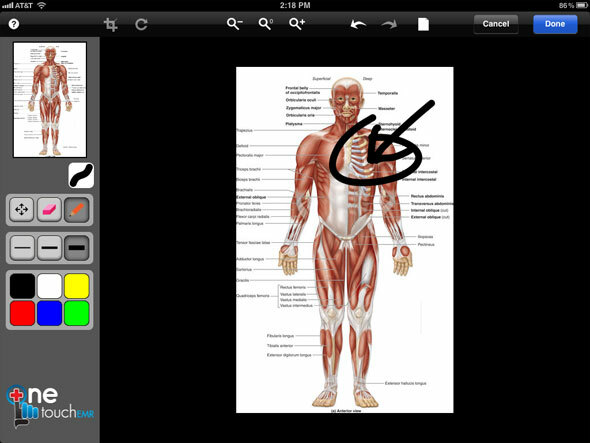 Use your finger to chart on iPad, Android, or Blackberry touch-screen devices. It works great on Windows or Mac computers as well. 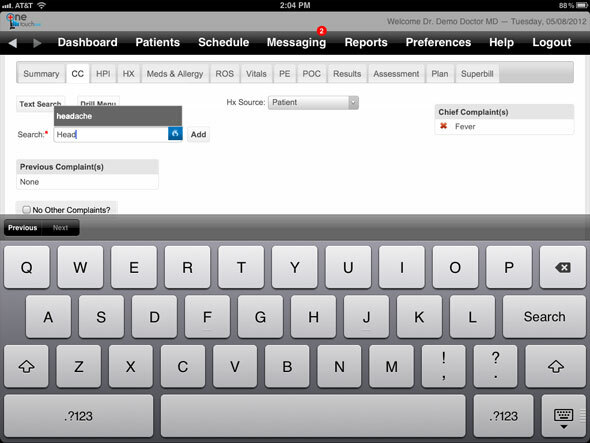 There’s no need to worry about complex hardware and servers to host your EMR. We take care of all that for you. Fewer headaches and lower costs allow you to focus on running your practice. Best of all, our product is certified by the government so you can receive Meaningful Use stimulus funds up to $44,000 and up to $60,000 for Medicaid! We offer a "LIVE" in-house backup of your data so you can rest-assured that your data is always nearby and available in case the internet is ever down. You don’t have to pay thousands of dollars for training and support. The One Touch learning curve is minimal so costs are significantly reduced.